Dr. Gardner proudly places OCO biomedical implants in his patients mouth. Implant dentistry has come a long way since the 70’s -90’s. The procedure usually takes approximately one hour. The anesthetic is very localized at the actual implant site. Post operative pain is surprisingly very little. I usually don’t prescribe any pain meds after procedure because all you will need is 1-2 ibuprofens or 1-2 Alleves to get you buy. I try to see the patient the next day to closely evaluate their healing. If you are looking for alternatives to dentures, full dental implants provide an option that requires a very little upkeep in comparison. But you need to be certain that dental implants are the best option for you. William C. Gardner, DDS PA can provide the complete dental care you need to achieve and maintain oral health. We provide full general, cosmetic and emergency dental care. You won’t have to worry about finding someone who can handle a general cleaning, tooth whitening and handling and dental emergency. If you lost all of your teeth or required multiple extractions, you would need an artificial replacement to allow you to bite, chew and talk. Dental implants replace the need for dentures and messy adhesives by securing the denture plate to implant posts. Specialized design metal post-like structures are inserted in the bone and, when allowed to heal through a process called osseo-integration, the bone cells adhere directly to the metal. After the healing period is complete, a set of dentures are specifically and individually designed to fit over the metal implants. This will provide a superior fit, more functional and more natural-looking. Also dental implants are commonly considered to be much more confortable. Not everyone is eligible for dental implants. If you’ve suffered a severe loss of bone density, have medical complications or other issues that need to be addressed, you may not be able to have dental implants done. Your dentist will be able to help you make the right decision for your oral health. Despite improvements in dental care, millions of Americans suffertooth loss — mostly due to tooth decay, gingivitis (gum disease), or injury. For many years, the only treatment options available for people with missing teeth were bridges and dentures. But, today, dental implants are available. Improved appearance: Dental implants look and feel like your own teeth. And because they are designed to fuse with bone, they become permanent. Improved speech:With poor-fitting dentures, the teeth can slip within the mouth causing you to mumble or slur your words. Dental implants allow you to speak without the worry that teeth might slip. Improved comfort:Because they become part of you, implants eliminate the discomfort of removable dentures. Improved oral health: Dental implants don’t require reducing other teeth, as a tooth-supported bridge does. Because nearby teeth are not altered to support the implant, more of your own teeth are left intact, improving long-term oral health. Individual implants also allow easier access between teeth, improving oral hygiene. In general, dental implants are not covered by dental insurance at this time. Coverage under your medical plan may be possible, depending on the insurance plan and/or cause of tooth loss. Detailed questions about your individual needs and how they relate to insurance should be discussed with your dentist and insurance provider. Instead of one or more individual crowns, some patients may have attachments placed on the implant that retain and support a removable denture. Your dentist also will match the color of the new teeth to your natural teeth. Because the implant is secured within the jawbone, the replacement teeth look, feel, and function just like your own natural teeth. 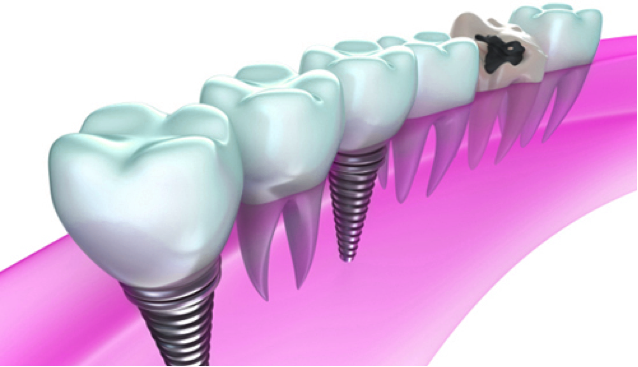 Most people who have received dental implants say that there is very little discomfort involved in the procedure. Local anesthesia can be used during the procedure, and most patients report that implants involve less pain than a tooth extraction. After the dental implant, mild soreness can be treated with over-the-counter pain medications, such as Tylenol or Motrin.